Welcome to the Bordertown web site! Bordertown is a band from Fort Smith, Arkansas that plays hit Classic Rock, 80s, Country, and Dance songs from your favorite artists like Keith Urban, Journey, Kool & The Gang, Blake Shelton, The Eagles, The Gap Band, Dwight Yoakam, Def Leppard, Cameo, George Jones, Lynyrd Skynyrd, The Commodores, Brooks & Dunn, Duran Duran, Bill Withers, and many more. We work hard to bring quality music and entertainment to casinos, corporate events, private parties, weddings, and other special events. The members of Bordertown have been friends and played together more than 20 years. We hope you come to hear us soon! Bordertown will be performing your favorite Country, Classic Rock, and Dance songs at the Cherokee Casino in Sallisaw, Oklahoma. Lots of new songs from your favorite artists. We are very thankful for all of the entertainment coordinators and event planners who have put their trust in Bordertown to provide entertaining music and to get the crowd involved. Here are some of their comments. 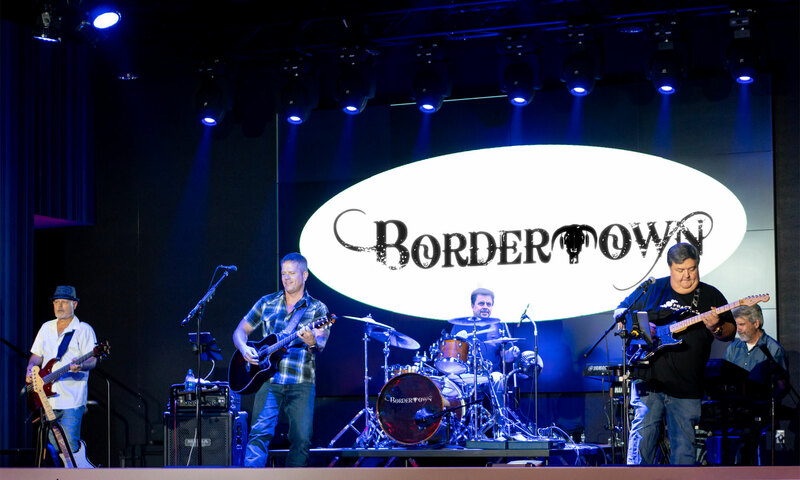 Bordertown is a band that keeps the guests at our casino on the dance floor. They are great musicians that are a pleasure to work with. Bordertown brought it to Bricktown Brewery!!! Great sound. Awesome song selection. Very entertaining! The crowd stayed engaged and really enjoyed the music. This band can read a crowd and deliver. Thank you Bordertown. You are welcome at BTB anytime! Bordertown played for our venue on a Saturday night. We were very pleased with the amount of supporters that showed up just for them. They acted professionally throughout the evening. Interacted well with the crowd, even took requests. Sound quality and talent was off the chart. Already have them booked for multiple shows in the upcoming months. I’m so glad we hired Bordertown to play our class reunion last summer! We wanted something festive to kick off the weekend and this band rocks. There is no way I would have predicted that a bunch of adults who haven’t seen each other for years would be standing in front of the band, singing and rocking and jamming full volume for hours! They absolutely made our class reunion a success and we are already planning to hire them for the next gig in five years…but I certainly won’t wait that long to go see them play. I would hire them for any event that needs fantastic music and energy! You guys are one of the best bands I’ve heard play here. Thank you for coming to Poteau And playing all that Great Music for us . I really enjoyed this band . Great Job Guys . You guys are great! We’re coming to hear you again on Friday night. Nice job guys. Very enjoyable. You guys were absolutely spectacular!!! I absolutely loved your performance!! !